I had leave booked for the week before so extended it to cover the Monday. 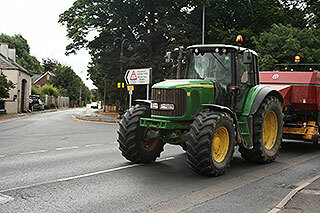 I originally planned to go over to Knutsford and watch the riders come through, but had a feeling it would be very busy. By the Sunday I had an increasing number of things I needed to do on Monday, and my window of opportunity was narrowing all the time. It was then I had a call from my parents letting me know the route passed through Lymm, my home village, meaning I could swing by their house, park up and cycle down the Trans-Pennine Trail to meet the race route. Everything had fallen into place. 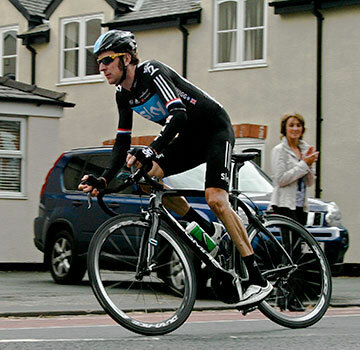 The local paper had reported the riders would be passing through Lymm between 12 and 12.30 giving me plenty of time in the morning to clear jobs and errands. After under-estimating how long my various jobs would take I arrived at my parents at 11.45, with my bike in pieces in the car! I quickly shoved all the bits back together and tore off down the trail with my camera on my back. Having had a closer look at the route the previous day, I picked a spot on the way out of Lymm, where I could stand on the outside of a bend at the end of a long straight and hopefully get a photo or two of the race. I arrived at my chosen spot at 11.55, and was surprised to find only three people standing there. Result! Moments later another cyclist arrived and was chatting to a couple of the other spectators. “They’ll be through about 1.30” he said to our surprise and, after a few rounds of “the paper said 12-12.30”, I decided to try and access the live tracking on the Tour of Britain website. Unfortunately, low bandwidth from a local network I picked up conspired against me and I resorted to plan B: text Dom at work and get him to relay the information! After a short text exchange it became apparent that the other cyclist was, in fact, correct. 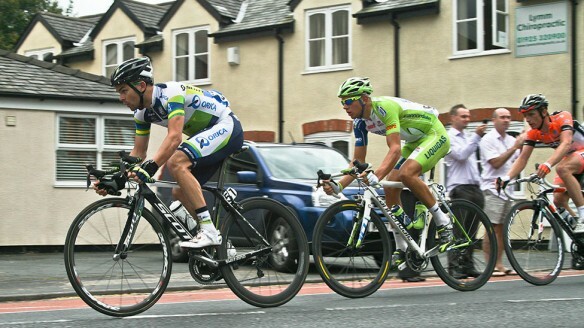 There was a breakaway group just passing Bosley reservoir, south of Macclesfield. By this time a bit of a crowd had started to gather on ‘my’ corner and passing vehicles were slowing down, wondering what was going on. As everyone now knew we were in for a little wait the occasion had become quite social: the more experienced fans explaining team strategy and ‘the peloton’ to the new fans attracted by the recent great achievements of British cyclists. I did a few test shots of a passing tractor, using my camera in continuous shooting mode, so I knew how far I could pan before the memory card would clog up and then I was ready. A steady flow of spectators arrived at the junction and I could see that people were gathering all the way down the straight. A policeman arrived on the scene and positioned himself between the bollards in the middle of the junction. Finally some action. News from Dom: the riders were in Knutsford, not long now. The sun had been out when I’d set off down the trail, but the sky had been getting slowly darker and now the rain started – ah, Britain in summer! Luckily it was only a shower and had stopped by the time the race safety vehicle passed through, its occupants waving at the spectators. At this point the roads were still open to traffic and there were mumblings in the small crowd, surely they would be closing them soon. Seconds later blue flashing lights appeared at the other end of the straight and in no time a police motorcyclist had pulled up at the junction blipping his siren. I got myself into position sat on the kerb and checked my camera again. In no time, another police bike arrived: lights flashing, siren wailing. He pulled up at the junction and the first bike left. This officer ordered the crowd out into the road as he stopped the traffic and then was off as another police bike arrived, all lights and sirens. This relay repeated itself again and again until eventually the police bike just came flying through the junction without stopping, a cacophony of engines and sirens, the riders waving to the crowd as they passed. In total there must have been close to twenty police motorbikes heading up the race creating rolling roadblocks as they went. Next through was the forward announcer, informing us of the race progress – the breakaway were a minute and twenty-five seconds ahead of the peloton, followed closely by the commissaire. And then. In the distance. There they were: the breakaway! Jack Bobridge came into view, with Matthias Krizek and Peter Willams right on his wheel. I put the viewfinder to my eye and tracked the group as they rode down the straight. As they approached the junction I pressed the shutter down and followed the riders through the bend until they were out of sight behind the, now sizeable, crowd. I knew I had just over a minute for the camera to write the images to the memory card and for me to get ready for the peloton. Plenty of time. I sat on the kerb, watching down the straight though the viewfinder of my camera, and in no time the peloton came into view. The clapping, cheering and whistling of the spectators swept along the crowd down the straight growing louder and louder as the riders approached the junction. I remained calm, spotting the golden jersey of Luke Rowe amongst the black and blue wall of Team Sky and the rainbow jersey of World Champion, Mark Cavendish. Then I noticed Bradley Wiggins’ yellow glasses and trained my lens on him. As the peloton approached the junction I pressed the shutter and panned with Wiggo until he’d gone, and the mass of the peloton filled the road for just a few seconds. The team cars raced through after the riders followed closely by an ambulance, two or three more police bikes and the remaining race officials. Five minutes had passed since the breakaway group rode through the junction when the road was re-opened to traffic. That was it. Just a regular Monday again. The only evidence in the memories of the fans gathered on the junction. And a few photos: the ones that came good.